While often overlooked, Automatic Doors are an integral part of a facility’s safety and security requirements. Properly operating Automatic Doors allow for the safe and uninterrupted flow of traffic while maintaining the security of the facility. The American Association of Automatic Door Manufacturers (AAADM) recommends that annual inspections be conducted by an AAADM certified inspector to ensure the safe and secure operation of these doors. A Wiring Solutions AAADM Certified Inspector can provide maintenance, repair and annual inspections of your Automatic Door systems in accordance with ANSI A156.10, ANSI 156.19 and AAADM standards. Our Technicians and Inspectors have not only completed the requirements for certification, but they regularly receive code and compliance updates and continuing education to ensure current standards and practices are always employed. The design, sale and installation of new systems, including Sliding, Swinging and Folding applications in almost any configuration. We also work closely with several door manufacturers and can aid in specifying the correct door for your unique application. Replacement systems that retrofit existing openings to meet building codes, handicap requirements and access control specifications. As a Security company we can also tightly integrate your building security into any application, and as an Electrical company we can make all the needed connections without the need of a separate electrician. More reasons that we are The Solution. Replacement parts and repair services for all major brands and models of Automatic Pedestrian Doors. With our stocked inventory and supply chain access we can have your systems functioning again in short order. 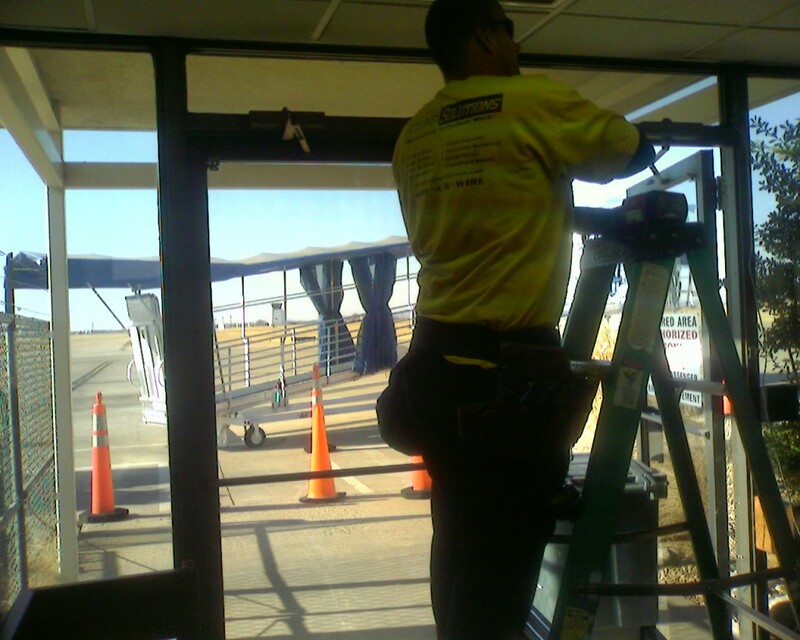 Emergency Repair and Preventive Maintenance Programs for all types of automatic door systems. A full line of ADA compliant automatic operators for both high and low energy applications. We carry and have access to numerous brands and styles to fit your unique needs. AAADM Certified Inspectors for the inspection and certification of Automatic Pedestrian Door openings per American Association of Automatic Door Manufacturers (AAADM) standards. Our inspectors receive up-to-date training on code changes and best practices to ensure your facility remains in compliance. Simply call our offices at 405-476-9473 to speak with us about how your facility can benefit from these services.